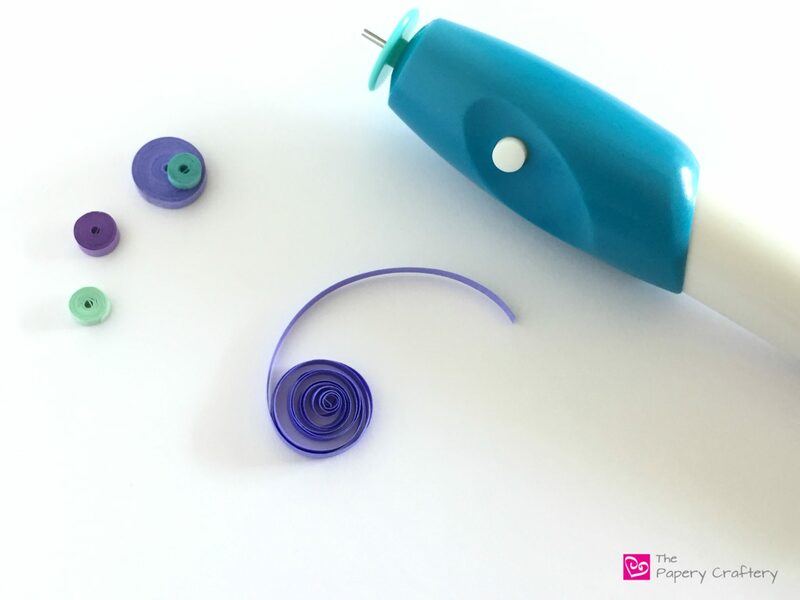 HomeDo you need a battery operated quilling tool? About a month ago, I stumbled across a selection of craft tools on a discount website. Now, this is in no way going to be a recommendation of that site (since I’ve read many mixed reviews), but the fact that they were selling quilling supplies really caught my eye. I scrolled through for a bit and found a battery operated quilling tool. The price was absolutely unbelievable, so I took the plunge and ordered one. After trying it out for a bit, I can finally share my thoughts in a review, and finally, answer the question ~ Do you need a battery operated quilling tool? The tool I received in the mail has no discernible branding on it, and no instructions, so I definitely had a learning curve to work with. It’s about the length of a standard quilling tool, but much thicker and heavier. The working end has a small slotted metal piece, with a circular tray underneath to rest your coils on. This tool needed a couple AAA batteries. Once those were in, I got right to playing. I loaded a strip of paper into the end, and, whoo, this thing is fast! My first few tries ended in a mess because I couldn’t figure out exactly how to hold the quilling paper strip and where to put my hands while it was working. I learned to place a finger on the top of the coil I was making while pulsing the power button. This took a few tries and quite a few strips of quilling paper! I made a short video to show exactly how fast this tool really is! Just like anything, definitely some pros and cons to a battery operated quilling tool. A battery operated quilling tool is really helpful for making mass quantities of tight coils, like when making these paper succulents. Open coils tend to get a little wonky when they come off the tool. Open coils tend to get a little wonky when they come off the tool. I found they didn’t open evenly at all. This might get a bit better with practice, but honestly, most of your coiling needs can be done much easier on a standard needle or slotted tool. However, those of us who have been quilling for a while or who have some wrist joint pain may find that using a battery operated tool can ease some of those aches. Another thing to consider is that automatic quilling tools do tend to cost a little more than other tools. The Quill Ease 3Birds is sold on CustomQuilling.com. There is a video right on the product page so you can see it in action! With additional beading or crimping attachments available, the Super Quiller can be many tools in one. This tool from IMISNO seems to be a bit smaller and easier to control. It’s gotten the best reviews of the tools here. As always, read as much as you can before making a purchase. All in all, I’m happy that I made my purchase. I do quite a bit of tight coils in my 3D quilling work and tutorials, and the time I’m saving in making those alone is worth it to me. Have you purchased one you really like? Or do you think they’re not worth the price? Hey Meredith! I finally sprang for a battery operated quilling tool (it’s the “Birds” brand one in the first picture, purchased at Joanne Fabrics) The first strip of paper I put in it got completely away from me…I wasn’t prepared for how fast it operated! And I agree that until you get the hang of it, it was pretty difficult to remove your coil without it coming undone and twisted. I had to laugh when you said in your post that you were unsure of where to put your fingers because I thought the same thing! But again, with a little practice it got easier. I haven’t been doing much quilling in the past few months , I tend to switch up my crafting from time to time and I was doing some rock painting over the summer. Thanks so much for sharing your experience, Gerri! It definitely takes some getting used to, doesn’t it? I’m hoping all is well with you and your family! I bought the first one you showed, couldn’t beat the price. I bought it because I am new at quilling and was hoping it would help me make tear drops the same size but it didn’t. I have practiced and practiced and still can’t make any the same size. I’m trying not to get discouraged but it’s not working. Any suggestions? I know it can be frustrating Denise, but don’t give up! Like I wrote in the post, I have trouble with some quilling when using the battery operated tool, so it might not be the best tool for making teardrops. Have you tried using a circle template? When I’m looking to make a bunch of same-size shapes, I use one of those. (Check out the suggested tools from Amazon right above the comment section on this post for examples) And they’re simple to use ~ measure your strips, roll your coil and when you take it off your tool, let it relax for a moment inside one of the circles on the workboard. As long as you use the same circle size, your coils will be about the same size. Then its just a matter of using the same amount of pressure when pinching your teardrops. I hope this was helpful, and I know you can do it! Please don’t hesitate with any other questions! I mentioned in the post that I wasn’t going to recommend shopping at the site where I received the quilling tool that I’ve photographed for this. In fact, I’ve had some issues with the tool itself since I’ve dropped it on the ground. Whoops! But, there are some links in the post about other quilling tools that have gotten pretty good reviews, so I would start shopping there. There’s a few links on this page to some tools for purchase. The reviews are pretty good! I have the same tool you showed in the video. I was like you not knowing where to put my fingers but I persisted and slowing got the hang of it, I also pulse the button but I find they don’t make even coils, even tight coils don’t look quite so nice when using this tool. I bought it because I have arthritic hands but I am stubborn and like the manual tool better. I thing doing it manually gives me much nicer coils. I also have never seen Quilling done live, I have learnt from watching internet videos too. Thank god for YouTube! Yes, YouTube is an amazing tool, too!